A gorgeous maroon jumper that boasts comfort, style, texture and warmth in one look. Included is the clever option of tying cuffswhcih changes the shape of sleeves depending on how you wear it. Handmade in London from surplus Merino wool with the help of a vintage knitting machine. A sustainable approach to urban chic. London’s antidote to fast fashion. Welcome to Valentina Karellas where every piece of knitwear is one-of-a kind. The brand was founded by Londoner Valentina Karellas who studied at the London College of Fashion and also in Florence where she received her Master of Advanced Womenswear and has garnered experience across markets in Italy and China. 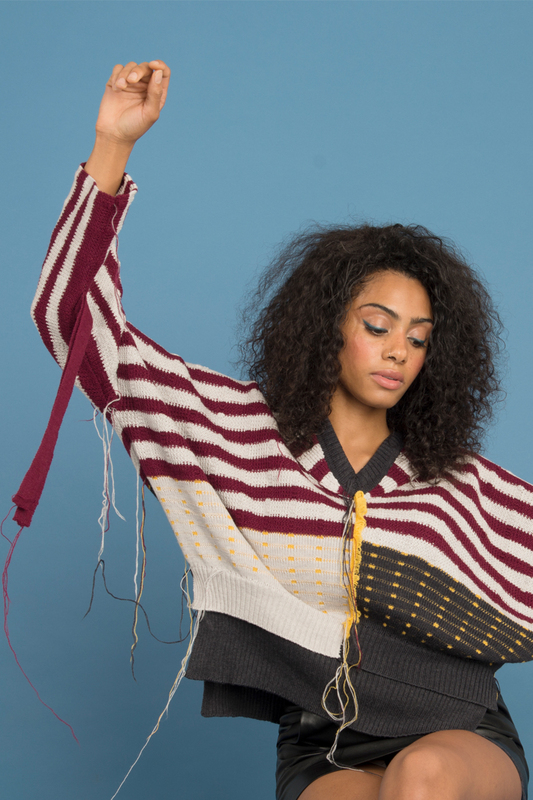 Garments are created using surplus yarn from large factories that would otherwise have gone to waste. The result: each one is a lifelong-lasting, entirely unique London original.